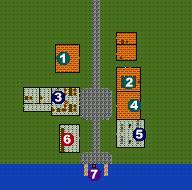 Upon first entering the town from the north, the building to the east is two apartments. The northern one is empty, but the southern one has a guard dog you can kill. Just across from the apartments to the west is the Common Fletcher, and south of the fletcher is the inn. The inn is run by Vincent, who also sells tickets for the boat to Lost Isle. East of the inn is a long building containing three rooms. The northern room is Dot's shop, where she sells alchemical ingredients. Just south of Dot is Merry, who sells the same things all his brothers and sisters sell. Note that even though this is a woman graphic, it is still a man, possibly a little bit of gender confusion there. South of Merry is Mervin. Mervin will ask you to become a courier for him. The job consists of buying Fine Clothes from him and carrying them up to Squiggus where you can sell them for a profit, then brining Savory Herbs back to Libras, which you can also sell for a profit. To the east of Mervin is a storeroom. If you took Mervin's job, you can pick up a few bundles of Savory Herbs in this storeroom, as long as you close the door and make sure you're alone first. That way you get the Herbs for free and get to sell them to Mervin for 100 coins each. The last thing of note in Libras is the docks. This is where the boat to Lost Isle is located.